The Dollar/Yen pushed lower on Friday after the weak data released during last week, fueled concerns about local economic growth. Furthermore, the Bank of Japan had a monetary policy meeting on Friday. Policymakers downgraded the Japanese economy, recognizing that the fall in exports and production was a result of slowing global growth. However, stronger equities limited the losses on this pair. Earlier this morning, Japan published the exports and imports data, both missing the forecast, down by 1.2% and 6.7% respectively. February trade balance however, came better than expected 339B vs 310B. 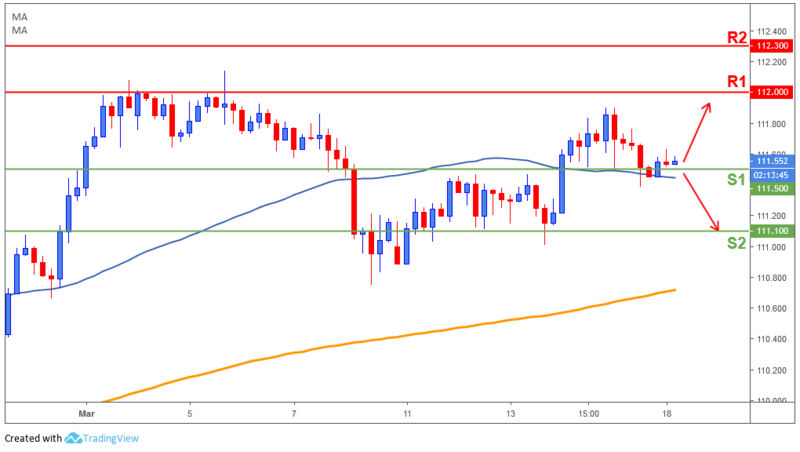 The USD/JPY pulled back from the highs on Friday but found support just above 111.50 (S1) and the 50-day moving average (blue line). If the bulls find momentum, we could see a possible 112 (R1) retest on this pair. If, however, 111.50 (S1) is lost, then price could likely pull back towards 111.1 (S2) to test it.